How To Prepare TANCET 2018 (तमिलनाडु कॉमन एंट्रेंस टेस्ट तैयार करने के लिए कैसे करें): The TANCET exam stands for the Tamil Nadu Common Entrance Test. It is a state level exam for all the candidates who wish to pursue their higher studies post to graduation. The scores of the exam are accepted in all colleges and universities of the state Tamil Nadu. The exam is conducted by the Anna University. However, this is to note that the candidates will get the selection in the colleges and courses of their choices only on the basis of their TANCET scores. Hence above the exam is much more important to all above the competition. Here in this article, we have given some of the Tips for Preparing TANCET Exam. To all the candidates who wish to get enrollment for the best education only the TANCET Exam Tips and Tricks can help in getting a good score for the exam. The most general instruction that shall be followed by every candidate is to follow a timetable. Having a timetable or you can say a planned routine can help you in way more easy execution of things. It is not mandatory to have a division a division of time but in the nutshell, the main idea is to be focused that you can keep things organized and don’t exceed any of the unnecessary tasks. The following tips can help you know How to Prepare for TANCET. Put your major efforts and concentration on topics in which you are weak. Be sincere and put equal concentration on all the subjects. Don’t start with easy topics. Any preparation without the good books cannot go in the right direction. The candidates are strictly advised that they should consult with their teachers or search online for the TANCET Preparation Books and study them along with the main course books. Wasting time in reading any and every book is a big no. This is the core essence of success. Unless you will learn to deal with time you cannot reach on How to Crack TANCET Exam strategies. The candidates need to keep in mind that the time management done in the exam time is very helpful in the last time exam performance. Always keep in mind that the time waits for none. The following tips can help you make strategies for time management. Focus to complete the syllabus on time. Break the topics in small portion and chase the time competency. Take the time deadlines to finish off the topics. The tests also play a major role in the selection of the candidates. The more you get comfortable with a test, the better it gets for you all to perform in the main exam. 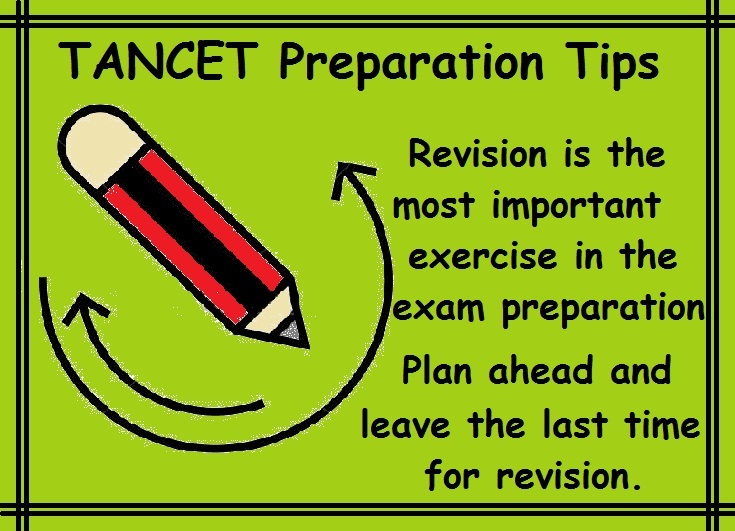 Hence TANCET Preparation Tips is that taking tests such as previous papers, mock tests, or the sample papers can help the candidates to not stress out and avoid hitting the panic button. Hence through the timely revision, it is easy to memorize all the stuff that you have reading and learning. The Tips for TANCET Exam to all is that, give yourself enough preparation time and avoid the last time hassle.